BF150.10, The records bucket - MB S.p.A. 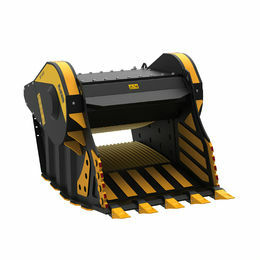 Unique in its kind in size and performance, the BF 150.1 is the largest crusher bucket in the world.Designed for excavators exceeding 154,000 lb and ideal for applications in quarry, mining, and general crushing on large job sites. 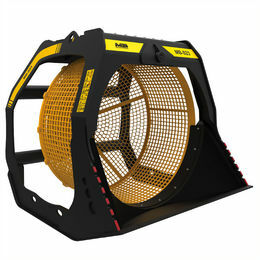 The BF 150.1 crusher bucket yields high results, productivity, and efficiency. Weighting over 23,150 lb with a load capacity of 3.2 cubic yards, the BF 150.10 crusher bucket is a machine capable of a production that exceeds 160 cubic yards per hour. With an unmatched bucket opening of 57 x 28" and an output adjustment from 4 in to 8 in, this machinery is essential for primary crushing in quarries and large scale construction.